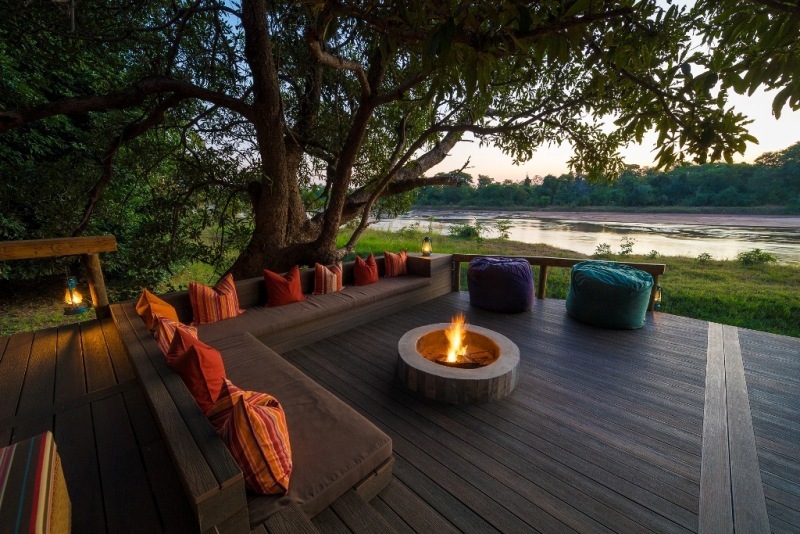 “An endless stream of wildlife will keep you enthralled” they promise and before I’ve done more than dump my luggage in the stylish reception area of Mfuwe Lodge overlooking hippo and croc filled lagoons in Zambia’s South Luangwa National Park it’s time to test that out. Here is reputedly one of Zambia’s best places for wildlife and we pile aboard an open jeep for the evening game drive as dusk descends creating mysterious shadows after a spectacular sunset. 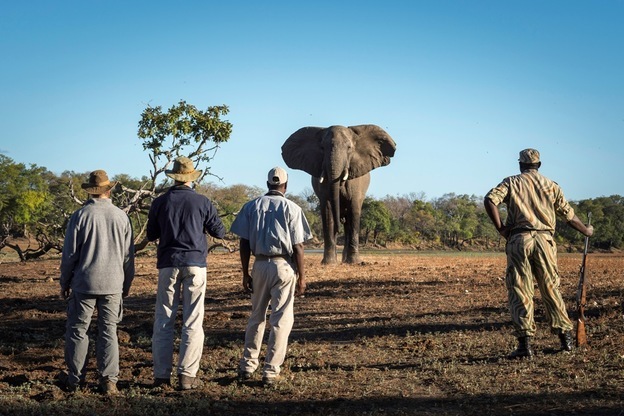 “We have a special relationship with our wild animals”, Suzyo Zimba, our astute and knowledgeable guide explains. “There’s mutual respect, we give the animals their space so they never feel threatened; in return we’re allowed to come very close to them here”. He’s right …that’s if you rule out our first sighting – the family of warthog nicknamed ‘the Kalahari Ferrari’ who on our approach zoom off tails antennae like erect. Minutes later an enormous hippo emerges from a lagoon, her back festooned with water cabbage. Her baby trots alongside heading for their grazing terrain. They are picture perfect and the cameras click away. By now two of the rear seat passengers are hiding behind their blankets in terror. His bluff called the elephant duly lumbers off into the bush. A veteran of a few African safaris I’ve decided no evening game drive can match this one in South Luangwa for pumping the adrenaline. 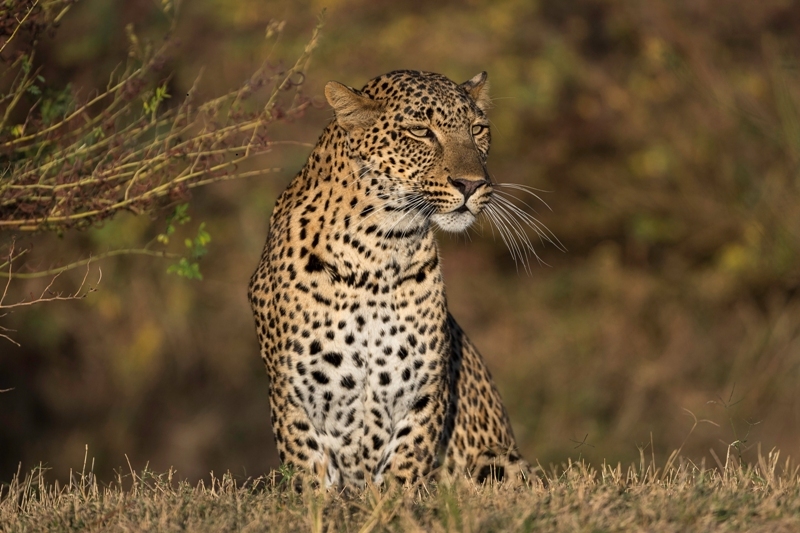 We search on for the elusive leopard whose numbers are healthy in South Luangwa but are often notoriously hard to see. Eyes peeled we are bounced up and down along a maze of tracks. Suddenly Suzyo whispers “hush” to silence the chattering South African ‘city girl’ travel agents aboard. A loud cracking noise is coming from the bushes ahead accompanied by a deep snarly growl. Our transport grinds to a halt and the spotlight lamp illuminates a scene straight out of National Geographic. 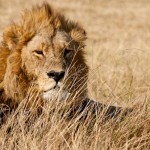 A male lion is crunching through his dinner – a whole warthog (hopefully not one of those we saw earlier) that he tears at ferociously pulling meat from bone in big chunks. Blood smeared fangs, paws and mane are metres away. Almost touching our fender a lioness (who most likely had delivered dinner) lies watching the food longingly . But whenever she edges nearer to it she’s repelled with an angry warning snarl from ‘himself’. 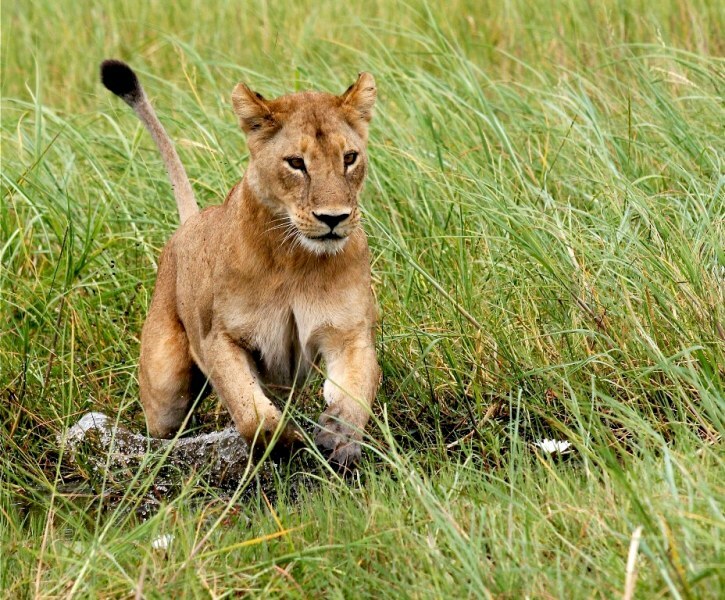 Next day, still searching for the elusive leopard (I had hoped to see one at the bush camp where other guests enjoyed several sightings but it was not to be) we came across the same lion and lioness. They’ were lying on a track, stomachs noticeably full ( the lioness who probably caught the warthog had managed to get the leavings) too comfortable to bother moving out of our path. The night before six lionesses thought to be members of the same pride had crossed the lawn in front of Mfuwe while we enjoyed pre-dinner drinks with managers Amy Ian and their terrific staff. From Mfuwe we moved on to Kapamba less than 40 miles away that took 3 hours to reach due to the state of the track. 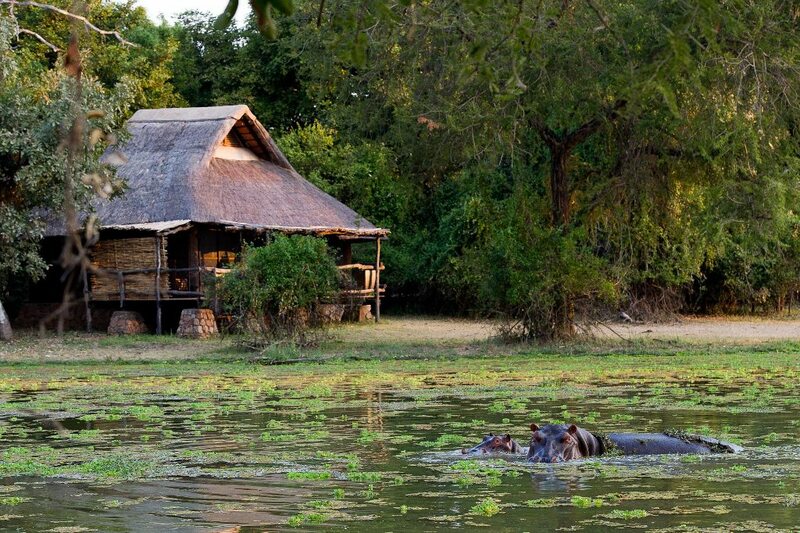 It’s also owned by The Bushcamp Company whose six authentic camps include stilted tree houses, thatched bungalows and tented compounds in amazing wilderness locations. 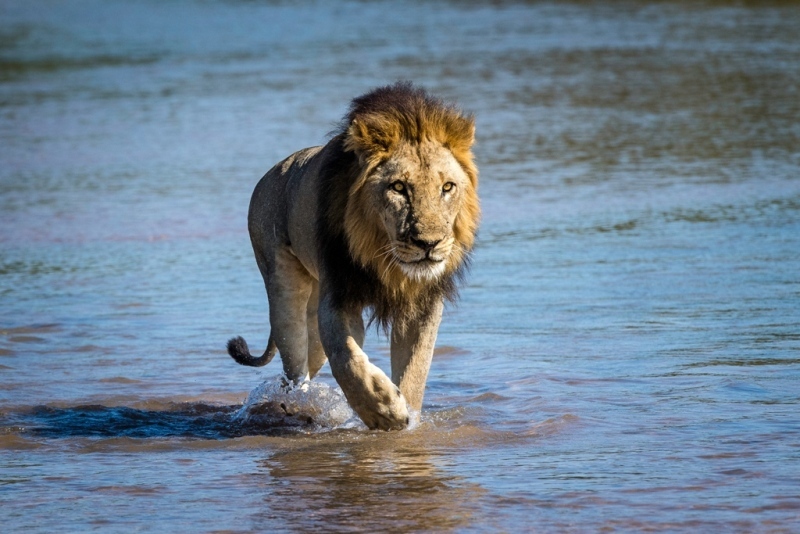 An African veteran, Ian Salisbury general manager at Mfuwe Lodge tells us hunter turned dedicated conservationist the late Norman Carr pioneered the walking safari in Zambia. 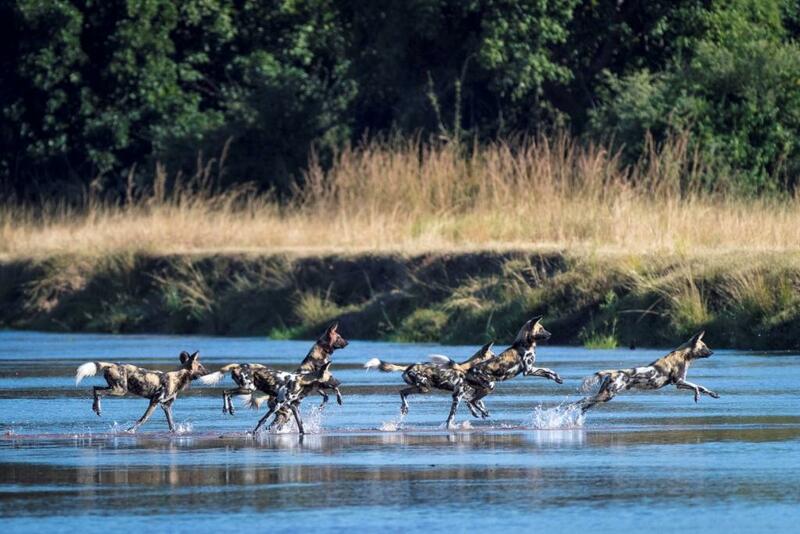 A powerful force in the movement away from hunting game with guns to watching and photographing the animals and bringing villagers on side Norman Carr set up the first of Zambia’s (then Northern Rhodesia) safari camps for foreign visitors back in 1950. Intrepid guests lay in bed in flimsy huts listening to lions breathing as they padded around outside exploring human smells. I thought of that in my four poster bed at Kapamba listening to the distant roar of lions and unidentifiable sounds and night calls. The highlight of my South Luangwa visit is daring to step out from the safe cocoon of the jeep, crossing the Kapamba river by foot, water reaching almost to our thighs and going walkabout for a couple of hours following the track of leopard, buffalo, giraffe and elephant. Christopher, an experienced national parks warden and scout is armed with a 458 rifle capable of killing a charging elephant at six metres. Some of us yearn to return home boasting about how close we’ve got on foot to a big cat or elephant others thank our lucky stars such encounters have been confined to the safari vehicle! Vast and sparsely populated Zambia is one of Africa’s most unspoilt and peaceful countries full of tourism potential and a superb place to go on safari with its extensive wildlife and pristine scenery. Zambia is most famous for being home of the legendary Victoria Falls that it shares with Zimbabwe , one of the seven natural wonders of the world and a must see for everyone visiting this landlocked country. As the guidebook rightly observes “visiting Zambia and not seeing Victoria Fall is unthinkable, like dropping in on Colorado and forgetting the Grand Canyon”. 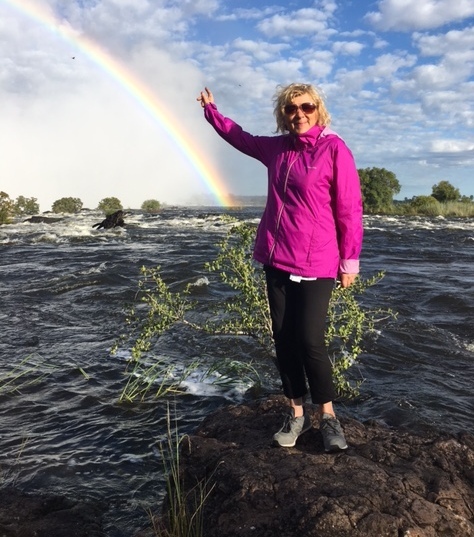 The Falls (they cost $20 to visit) were in their prime during my visit with a phenomenal 10 million cubic litres every second dropping to a depth of 103 metres along its almost 2 km long expanse between Zambia and Zimbabwe. They were framed by a perfect rainbow emerging from behind canopies of spray and mist rising from monstrous cascades. Get there during the dry season and you can take a dip in ‘the Devil’s Toilet bowl’ and go white water rafting in rapids with names like ‘Terminator’ and ‘Judgement Day’. Bungee jumping and abseiling are among the other year round adrenaline rush offerings. In 1855 The first white man to set eyes upon Mosi-oa-Tunya (the Smoke that Thunders) its local name Dr David Livingstone the Scottish explorer and missionary declared“scenes so lovely must have been gazed upon by angels in their flight.” It’s a lot easier to reach them these days now that Ethiopian Airlines has recently launched its Addis Ababa-Victoria falls route connecting with their daily flight from London. Only from the air can the true scale of Victoria Falls be fully appreciated, it’s said though I loved getting close up and personal with them on foot. 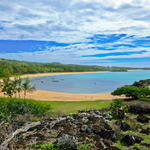 The cheapest helicopter ride takes 15 minutes and costs €195 with Batoka Sky. The top address in these parts the Royal Livingstone Hotel is so close that the roar from the Falls and sight of smoke like spray is part of the scenery. 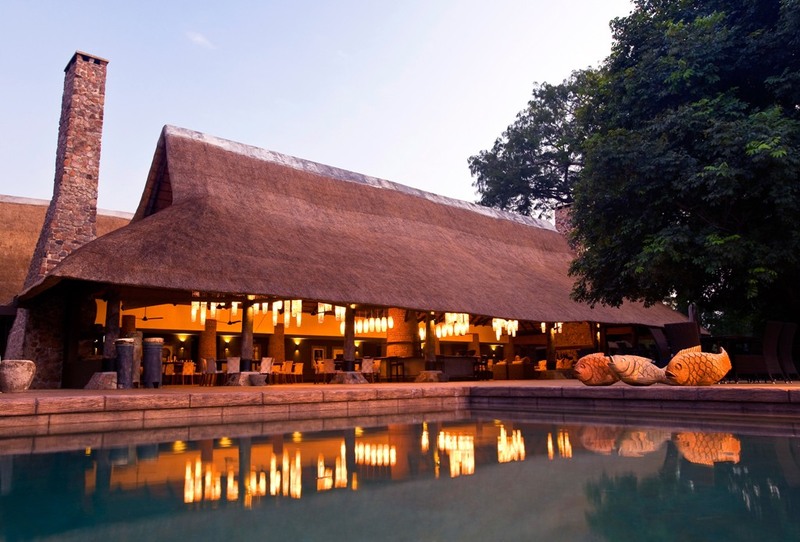 Livingstone, Zambia’s most popular tourist centre is also gateway to superb stretches of the upper Zambezi, I took myself off to two of its special lodges perched on the banks of Africa’s fourth largest river. 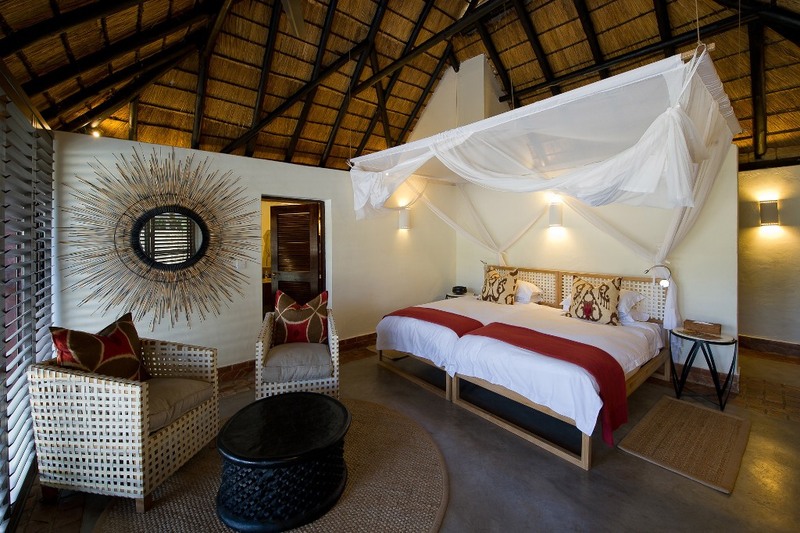 Waterberry long established and noted for comfort, friendliness and great food and luxurious Tongabezi rated one of Africa’s top river lodges with sumptuous accommodation and all round 5 star experience. Both lodges offer a list of included activities from fishing to sunset and sunrise cruises, bird watching etc., Visits to local villages and schools built and supported financially by lodges and guests donations are encouraged underlining a genuine desire to improve local communities and let them benefit from tourism. A stop off in Zambia’s capital Lusaka whose new state of the art airport terminal is nearly completion is the norm if you are arriving from outside Africa. One of the African continent’s fastest growing cities Lusaka has no fewer than 20 shopping centres, enjoys frequent traffic gridlock and new developments are going up rapidly. One of the worthwhile tourist attractions is a wonderful elephant orphanage Lilayi a 45 minute drive out of the city. Rachel from Going Places Tours and Travel who offer city and interesting country tours arranged my visit to Lilayi . After a couple of nights stay at the friendly comfortable Lusaka Grand Best Western Plus hotel I was getting the inside track on the city’s burgeoning development and Zambia’s great tourism potential as the hotel was hosting some delegates at Zatex, Zambia’s Travel Expo. 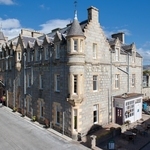 The hotel restaurant had special Chinese and Indian menus as well as international cuisine and very tasty it all was. The pool out front was deserted as apparently the early to mid 20s temperatures were considered ultra cool during my visit. If you only enjoy one hotel experience in Lusaka let it be at the Raffles style Intercontinental in the diplomatic district The place oozes Colonial charm harking back to times when going on safari was a tedious and even dangerous pursuit involving days of travel by road into the wilds with few if any creature comforts. Many a traveller let their hair down here before departure and on returning to civilization the safari goer looked forward to a bath and good food at their journey’s end. Times may have changed in the world of safari experience but that didn’t stop me letting down my hair here at the Intercontinental ‘club’ either!